This Nigella chocolate mousse recipe from Nigellissima isn’t especially Italian. But it’s very quick to make and perfect for pampering a special someone. Just how many Nigella chocolate mousse recipes are there?! her date and chocolate verrines somewhere although I can’t remember which book exactly. It is fair to say Nigella likes moussey things in pots and tends to make versions which do not require whipped egg whites. I did wonder whether the world needed another instant Nigella chocolate mousse recipe but the difference is here that she uses condensed milk and whipped cream rather than eggs. During a month when healthy eating is on most peoples’ minds I did baulk that this Nigella chocolate mousse recipe used up a whole pot of Elmlea double cream to make just three desserts. So this is a very rich treat indeed. I’m going to be a good girl and feed these to my delightfully slim husband and son – until Valentine’s Day at least. The original recipe was in double quantities and made six desserts. It is actually supposed to be a chocolate orange mousse with Grand Marnier or Cointreau. However I ditched this since I planned to feed the mousse to Ted. Probably if I were serving them with the orange liqueur I would sprinkle orange zest on top instead of grated chocolate. I had run out of oranges when I photographed them. Although these pictures aren’t THAT bad I do feel compelled to apologise… if I were another type of food blogger I might be laying out a tableau with fresh oranges chopped up in different positions but frankly it’s January, the light is rubbish and this is the best I could manage today. I love looking at said type of food blogger pictures but with the exception of Ren and the brilliant and inexplicably underrated Greedy Gourmet, they’re mostly created by people who don’t have young children. As you might have noticed the frequency of my posts has been greater lately – after a relatively fallow period I am exercising my blogging muscles with a spot of personal NaNoBloMo discipline, albeit in January, albeit Monday to Friday only. But this is what works for me right now. These natty chunky little stemmed glasses are wine glasses I recently found in IKEA and only cost £3 for 4. They’re perfect for serving individual trifles and desserts like this although I think they’re a little indelicate for drinking wine. Were I still twenty and expecting house guests who regularly smashed all my wine glasses they’d be ideal!! 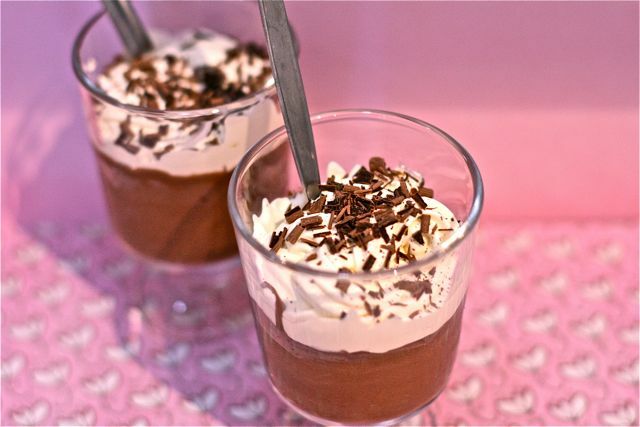 Despite the omission of alcohol I haven’t made enough changes to justify publishing the recipe here – instead I am linking my Nigella chocolate mousse to Sally at Recipe Junkie who is hosting this month’s Forever Nigella with the theme “food to cherish your loved ones with”. Also, since I’ve been meaning to make these ever since I bought Nigellisima in September, I am sending them to Jacc’s Bookmarked Recipes. What food do you cherish your loved one with? If you like these chocolate pots then you’ll love my Pinterest board “Lovely Things in Jars”. Follow Sarah Trivuncic Maison Cupcake’s board Lovely things in Jars on Pinterest. Personally, I think these look scrumptious! This sounds like such a rich and decadent treat, definitely one to make soon and enjoy! There are lots of good things in it – I’ve been making a few for Dinner With Crayons but they’re not suitable for this month’s theme. these look so good! I am craving one right now with or without the orange! Those photographs are looking better than anything I’ve managed in this rubbish light recently – they certainly make me want to dive into one NOW. I’m feeling more positive today – the sun is out! The light is pretty dismal, isn’t it?? Unlike the rest of the world, I am NOT eating particularly healthily this month so I’ll have one of those please (with the Cointreau on the side in a shot glass!). Oh the light at the moment is hopeless and I am not even that good at taking pics so I can imagine how it bothers you, whose photos I always adore. Good glasses find too, and filled with this how could anyone resist. I would not need any help with mine! Thank you – I was immensely cheered by some sun yesterday afternoon, my kitchen looked light and bright again. As you’ve probably seen my kitchen is a white light box so if it’s gloomy for me it’s even worse for people with darker rooms to take pictures in. Roll on spring! Ha! You should see the photo that I am about to publish. 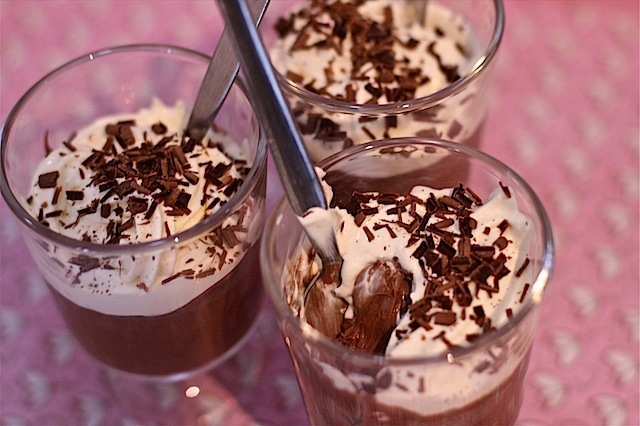 Oooh can we have too many chocolate moussy recipes? This one with condensed milk and whipping cream sounds heavenly and in my book even better than regular mousse. And oh yeah I’d definitely make it with Cointreau! Jamie – I’m going to have play around with other chocolate varieties and liqueurs so watch this space! Ah Sarah – thanks for entering! Instead of the elmlea cream – would it work with a container of that soya cream substitute? Sort of halves the guilt ? Yes I think that would work very well!